And now for the last flight in the round of 64. We've got some heavy hitters here with Heath and Three Musketeers, and also some entrants I'd love to see melt away into chocolate smears. (Looking at you Sno-Caps and Whoppers.) By the way, I totally agree with Bunting that Milk Duds are a dental danger, but I still adore them. 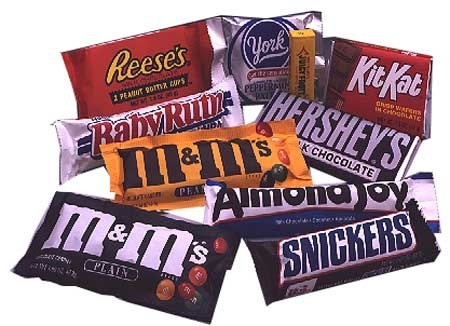 I remember getting the tiny, yellow, "fun size" boxes in my Halloween haul. Usually, those boxes could fit only two Duds, but every so often you got three. Those were happy days. 1 Milky Way vs. 16 Sno-Caps. I used to like Milky Ways much more than I do now; I was really into airy-nougat candies as a kid. It's still a pretty solid candy, particularly in bite-size form, which gives it a more pleasing density. More importantly, it is not a Sno-Cap. I hate Sno-Caps. I hate the burnt taste of the chocolate, I hate the little vermiculite-y bits that get jammed down in my gumline and stay there for entire presidential terms, and what I really hate is that they seem pretty cool-looking, and like they could taste good, but they don't. They taste like disillusionment, and if you yourself don't have a story about breaking a tooth on one, I guarantee that you know someone who does. The only thing I enjoy about them even a little is referring to them as "Sno-Craps." Milky Way by a landslide. 5 Twix vs. 12 Milk Duds. I've never gotten Twix. I like them fine, but they get melty too fast, and I don't love the cardboard top note. Milk Duds look like deer pellets (hew) and rip out any fillings not put in with concrete, but I far prefer them, despite the super-annoying ad campaign from the '80s with which I still associate both Duds and Whoppers. Remember those, the faux hip-hop "M-m-m-milk Duds" spots? Gigi and I would call each other, say "M-m-m-milk Duds" into the receiver, and hang up; for months we did this. Girls' school is really boring. Anyway! I like Duds better but accept that they will not survive this round. 4 Nestle Crunch vs. 13 Crunchie. I don't like "crispety" candies that much. Crumbling up a Crunch into ice cream or fro yo works for me, but plain, on its own? I just would never bother. But Crunchie is an acquired taste, for sure, although the people who love it love it; I sent dozens of them to the Biscuit in law-school care packages. The honeycomb/Styrofoam combo is not everyone's jam, so while I prefer Crunchie, Big Blue probably wins this easily. < B>6 Krackel vs. 11 Whoppers/Maltesers. See above; Krackel is easily the most boring in a bag of Hershey's Miniatures (but melts the least easily, which is a minor point in its favor), but the malt ball is like black licorice -- a lot of folks really love it, but many more folks extra-hate it. [I have a huge grudge against Whappers. I got a box at a movie, thinking they were going to be a substantial candy, and instead I got a mouthful of slightly sweet air. I've never forgiven them for that disappointment. --Keckler] So which wins, dull or despised? Dull, here. 3 Three Musketeers vs. 14 Wonka Bar. God, I used to love Three Musketeers. I would skin the chocolate off and then eat all the filling together. I know: gross. It's a classic, but it's a bit too simple and airy for me. The Wonka, meanwhile, is something of a disappointment. Chocolate-dipped graham cracker should rule, and has, in other formats, but the Nestle version always tastes stale. Musketeers for the win. 7 Rolo vs. 10 Toblerone. I feel like Rolo had a heyday about 20 years ago, but nobody really eats them anymore, and the rolls you see in the store look weathered and old. I like them a lot when I can find a fresh pack; they aren't as punishing on the teeth as other candies of that style. Toblerone, meanwhile, is crap. Whoop dee doo, you can break off the triangles, or slam down that orange one on the ground and eat the bits. The orange one is crap with a Lysol aftertaste. No thanks! Rolo all the way. 2 Heath vs. 15 Lindt/Lindor. I don't know if Heath should win on the strength of its association with beloved ice-cream flavors, but it may, and that's fine with me. I have no problem with Lindt or Lindor -- it's the only kind of candy with raspberry in it that doesn't taste like perfume -- but it's got no shot.